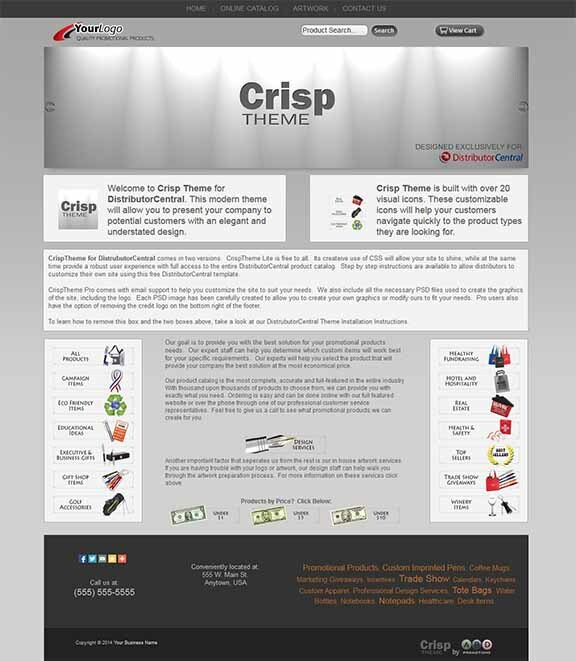 CrispTheme PRO for DistributorCentral allows users to fully customize all aspects of the template. Included with the PRO version are all the necessary PSD files used to create the graphics of the site, including the logo. Each PSD image has been carefully created to allow you to create your own graphics or modify ours to fit your needs. Pro users also have the option of removing the credit logo on the bottom right of the footer. CrispTheme Pro also comes with email support to help you customize the site to suit your needs. CrispTheme slider PSD – Includes all slides used in the demo. Crisptheme catalog icons PSD – Includes over 20 catalog icons used throughout the theme. Also provides a template for the user to create their own icons. Be the first to review “CrispTheme PRO for DistributorCentral” Click here to cancel reply.